Andy Murray nearly succumbed to the London pressure and the easy power of Tomas Berdych Monday on opening day of the ATP Finals. Murray dropped the first set before storming back on Berdych to win 3-6, 6-3, 6-4 in round robin Group A play. The big Czech started hot but eventually cooled off allowing Murray back into the match. In the windless conditions, Berdych showcased just how dangerous a threat he can be when playing indoors and free from weather issues. But as we often see from him, he also came up just short once again against a big name player. In second match of Group A, after a tight first set former champion Novak Djokovic dove his way past JW Tsonga 7-6, 6-3. Djokovic twice hit the floor of the O2 Arena in attempt to play balls, but he remained unscathed. Tsonga drops to a pretty pathetic 1-13 against Top 10 players this year. Next up for Novak is a critical date with Murray on Wednesday. And I still think both guys will get out that deathly Group A. Group B begins tomorrow with six-time champion Roger Federer against Janko Tipsaravic and David Ferrer meets Juan Martin Del Potro. Obviously Federer, who’s won his last 10 matches at this event, is the clear pick in that one, but I think Janko will keep it closer than expected. Maybe sneak out a set? In the second match, both guys have enjoyed excellent fall campaigns – Ferrer just picked up Paris – but I like Del Potro’s power indoor. If he’s on he’ll get through that one in straight sets over Ferrer who probably hasn’t had much time to prepare on the London courts. But it should be a fun match to watch. Tennis Channel again has live coverage tomorrow of all matches starting at 7am ET. it was expected that the top guys will prevail today..and they did. Berdych is tough, glad murray came through that one. delpo has a bad record against ferrer. I can’t remember the time he actually beat him. that match should be interesting. With Federer’s current form, [post-cincinnati], he might even be upset by tipsy/ferrer [2 guys who have never ever beaten Federer ever! strange. becuase Ferrer has wins over all the other top-3 including GS wins over nadal  and murray! Good for him to have fought through the Jo-Will onslaught. Interesting post racquet put up on the other thread about Tsonga’s new coach; it could be rejuvenating for him, and he loves the AO, so who knows what could happen there next year, after the off season? Ferrer is the road runner and will be a problem for DelPo due to his running abilities. To neutralize Ferrer, Delpo has to serve big and then follow it up by a huge FH. He can’t give Ferrer pace, which is what he thrives on. I am somewhat awed at Ferrer’s ability to run, run, run. I think fed will surprise us by having easy wins over Tipsy and ferer. He’s beaten them previously on every occasion, so I doubt he’ll allow them to get the better of him. Even if ferrer has not beaten him, fed has to always work really hard to beat ferrer, coupled with not playing great at the moment…We will just have to see but I have a feeling it wont be easy for roger. Andy had something like 10 break points in the first set, which shows he was already “getting into” Berd’s serve, so am not sure “nearly succumbed” is a true reflection of the match. However, Berd is tough so I’m glad Andy’s got that win. Well played Nole too. Really even with JW a little better in the the first set, until the tie break. Then Nole strikes and POW! Wow, I didn’t realize Andy had so many bps even in set one Margot. Nice to see Andy pull off that match. I hope he does well in London – give the home crowd more to cheer about. The British team of Fleming & Hutchins are the doubles alternates. As much as I’d hate for someone to be injured or sick, it would be great if they got a chance to play in front of the home crowd. cant believe i am seeing all these matches live…and my god plays today…will be there feddy bear to shout and scream ur way through!!!! O2 here i come..
Good wins for Nole and Andy. Can’t wait for their match Wednesday. Should be very close and fiercely contested. Until then, wake me up when today’s matches have completed. Federer is going to win the WTF AKA YEC this year. Everytime he plays Ferrer at the WTF, the Swiss wins the YEC. He might not own the record at a particular slam like Emerson at the AO with 6 titles or Nadal at the FO with 7 titles but he owns the record at the YEC with 6 titles and soon to be 7 titles. Federer will go down in history as the indoor king. That is a place he owns the record while at Wimbledon he is tied with Renshaw and Sampras with 7 titles and at the USO, Sears, Larned and Tilden are tied with 7 titles. I cant see Fed not winning group B,the question is who will join him,im thinking Delpo,Ferrer will run out of steam,and theres a ? mark regarding the fitness of Tipsaravic,group A seems more open IMO,but i think Nole and Andy will come through,im thinking whomever meets Roger in the final to me is playing for the runner up spot,however we will see. I cant see Tipsaravic troubling Roger much today,i think the most open match will be the Delpo/Ferrer match if Ferrer is not too tired it could be quite a contest,Delpo will have to do alot of running,i have to work so i will miss the matches,its great when you can just watch and enjoy from a neutral point of view,i like all the other players,but the only player i have emotional investment in at the WTF is Murray,i can be a nervous wreck watching his matches sometimes. I’m sure Federer was ecstatic to see his lucky charm Ferrer in his WTF group. Ferrers a good player,but thats how great Roger is at the WTF,been that consistent isnt about luck,its down to the rest of the players to raise their level against him,i really dont see what he has left to prove?i dont believe theres such a thing as an easy group at the WTF,these are after all the top 8 players of the year,any one can beat each other on any given day. Federer, for me, definitely wins his group. The real problem for him later on maybe court speed- it seems unusually slow for the o2 arena. It’s quite amusing looking at the column headed “week change” in the Rankings Table. Mostly, well nearly exclusively, you have numbers like 0, 3, -4, 2, 7 -6 and so on. And then there is JJ – 43. And Lodra – 69. Who’d have thought one tournament could make such a difference…..
Federer wearing an indigo shirt. I like the look,also liked Noles and Andys look yesterday,i have to say Nole looks rather thin,too thin IMO,put some weight back on Nole please,meanwhile Feds cruising so far 3 o up already,broke Tipsys serve 1st game, looks ominous already. LMAO Jamie, you fooled me with that one lol! Federer is the GOAT. 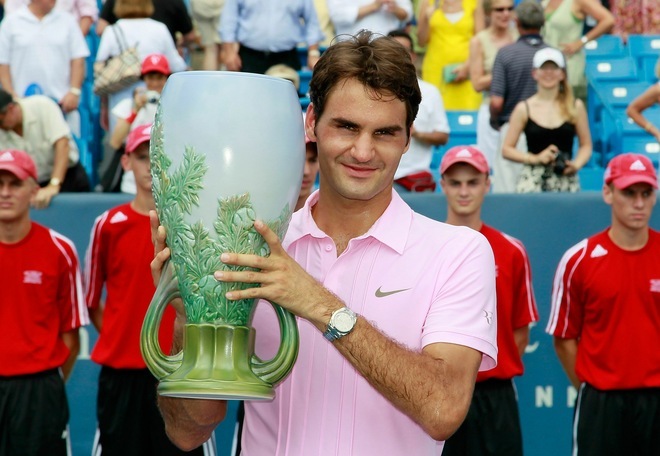 He can win tournaments wearing any color… Pink, indigo, etc. No color is bad juju for the GOAT. Who’s next – a tired Ferrer or a tired DelPo? Djokovic was sharp. Murray wasn’t. Fed was brilliant to watch in that one- a 1 hour 10 minute masterclass! 1- Footwork: Very good, nimble and got to most balls comfortably and in good time. 2- Enthusiasm: He seemed to enjoy himself out there, alot of fist pumps, eagerness to win points etc. All in all, fed remains my pick on that showing- he seems like he really wants the title here, and at his best- for me- he’s still the best player in the world in indoors! His age doesn’t matter when you play like he did today! Djokovic was only sharp in the 2nd set. Murray also got better later in the match. I think they’ll both bring their A-game tomorrow. Let’s give the title to Federer already. Jamie. Didn’t you say Delpo or Ferrer would win??? #makeupyourmind!! Especially the Novak part, as the man himself pretty much said so. There was no tension in the match – but you can’t blame the players for that, tension after all is independent of the volition of the players. It generally occurs when two players are evenly matched. Barry Milns revealed the rather astonishing statistic that by the end of the match Federer had held for 53 times in a row against Tipsy (going back to the AO match in 2008), and in all that time had yielded only 2 break points. Gannu, I bet you enjoyed this maestro display! Federer was in great shape and his decision to bypass Paris thoroughly vindicated. You can’t blame Djokovic for that, however, only Father Time. Djokovic fully deserves his #1 status. It is interesting that Federer has in mind to regain it, and that’s a battle we can all look forward to. I especially enjoyed Federer’s forrays into the net. Imo, he’s been particularly impressive in that area over the last couple of years, and Annacone – who was hired partly to impart his own specialist net technique – deserves credit for this. Early days, but Djokovic is going to have his work cut out beating Federer on this surface. I’d be surprised if he can do it. Murray, I feel, is the man to challenge the master. Completely AGREE with that viewpoint Grendel. I think those 2 are the best indoor players in the world right now- when on top form of course. Andy needs to beat Novak first though, so that he can show he really is the likely challenger to fed for the title. Right now federer looks really good for the win! I thought that since they won recently tournaments indoors…. Basel and Paris. BUT Franzua is predicting Fed to win the WTF. Last year he also predicted Fed to win the WTF. So if Franzua predicts Fed then Fed it is! One of the Argie guys. errr…a dress would be bad. Its Djoke Murray tomorrow. Another 4 hour slugfest that leaves both of them drained?? I somehow think this one will be a straight sets win for one of them. Just don’t know which one! Ferrer Delpo could last long too – Ferrer gets everything back. IMO Murray and Djoker look very formidable. IF Fed gets through, I am sure they will welcome there chances against the great one. please check out capybaras that bear uncanny resemblance to Nadal. #looking so good nadal! Fed has won this so many times he has a great chance. It is very bad news and looks very serious, I don’t know how and if Nole can stay focused on tennis. I will not say anything else, just hope and pray that Srdjan is going to pull through. You probably translated news already but the fact is that he was in critical condition when he was admited in hospital in Belgrade and was treated for sepsis, it looks that bacterias are just don’t giving up and he has to be flown to Germany urgently. U guess we have best doctor on this blog who is going to tell us how really ill is Srdjan and that this is Nole’s PR trick. That is what I, you and any other normal person thinks but not all posters do think so, I guess you did read all the posts so you know that. WOW that is bad news re nole’s father. Hope his father pulls through. As we all.know, sepsis is life threatening- i wish the best for novak’s father. What was the initial event that caused the sepsis? Wog boy, Jane, do you know? Who the HELL uses their parent’s ill health JUST to create a media story? NO ONE- certainly no one with their mind in the right place! This is ONLY a tough time for nole regarding his father, NOT a publicity oppurtunity! Seriously, I CANNOT believe we are even entertaining such a dastardly bizarre, horrible notion! Good luck to his father, hopefully he get’s better and very soon too! Ferrer breaks- and he looks very sharp atm! the mans a machine i tell ya! 12/14 points won by ferrer, wow! ferrer is playing some really good tennis here- brilliant timing of shots! Delpo needs to be patient here, wait for the right moment to go for the big shot in the rallies- looks for the winner far too early atm. Here is another reason why I am proud to be a Federer fan. This is from today’s issue of USA Today. Thanks for the article, it’s a nice read. Not a fed fan but i have ALOT of respect for him regarding the work he is doing for the players. Fed’s right- rafa needs to help him on the council since rafa himself, like fed mentioned, has alot of influence and it would help the player’s IF rafa helps fed out in this matter! Ferrer is on fire. Making Delpo play the extra shot every time. Just goes to show that firepower alone is not enough in the current game. hate to say anything against JMDP- BUT to me he is getting schooled by daveed here! Ferrer is playing awesome stuff at the moment- more than a roadrunner for sure! And unfortunately, it seems that Delpo has called for the trainer. That’s just want this group doesn’t need! I don’t know the reason or how he got it. nice clean win for roger. looks like a third set for ferrer and delpo. Delpo fashions a break back in the 3rd. Match of the tournament so far, imho. Ferrer is still a beast. He thoroughly deserved that win. It seems that age 30 is becoming the new peak, or at least a second career peak. I hope Ferrer would know that even though he may not be the first favorite of many tennis fans, he is the guy who is most beloved by all. Is there anybody out there who does not like this guy? The DA completely agree im becoming a huge fan of Daveed lately,its great to see a player at the ripe old age of 30 rolling back the years and playing some fantastic tennis,teaching the youngsters a thing or two,just sorry it had to be against Delpo though as i love him too. Polo hes such a down to earth,polite friendly quiet unasuming man,who just goes about the buisness of playing tennis,no whinging,whining or moaning,win or lose,IMO just about the nicest male tennis player on tour. Im so sorry to hear about Noles dad,i dont think anyone would think any the worse of him if he decided it was for the best to pull out now of the WTF,family comes 1st. Knowing mentality of my people, the last thing Nole’s father would like see is Nole pulling out, regardless how bad it is or not, quite the opposite and I am sure Nole knows that though it is hard to see how he can stay focused. Wogboy one way or the other i only hope everything turns out ok,lets just hope for the best eh. There’s something about Ferrer (as a tennis player)that people can’t quite take him seriously. I guess it is because he doesn’t have the one huge weapon. At any rate, he is higher ranked than delPo and has been for a long time, and yet it is still seen as a surprise if he beats him, even though he has an excellent h2h against him. In the sky sports studio, the prestigious ex tennis stars all plumped for a del potro win. This scepticism is not entirely unjustified. Ferrer’s ranking accurately reflects his status in the field, no doubt about that. On the other hand, there are some players who occasionally beat members of the top 4 – and Ferrer is rarely if ever one of them. Ferrer seems to have little belief he can beat any of them, and at an unconscious level, this must inhibit him. It’s as if he has found what he regards as his comfort level in the pecking order, and he will defend this to the death – but he expects no further rise. (The possible prospect of overtaking Nadal is a red herring, since if it happens, it will be a result of abstentia). I hope this changes. At one stage during the match, luckily for me it turned out to be during the longest rally of the match, I decided just to watch Ferrer’s legs. Really, it was astounding. We tend to patronise him slightly by referring to his terrier like abilities, but the joke is on us. You watch a terrier running around in the park; the sharpness of movement is astounding, gravity is toyed with in the most delightful way. Ferrer doesn’t have 4 legs, so he can’t quite manage that, but I doubt if there is a two legged beast on the planet who can approach his quicksilver movements. I am not referring specifically to speed – I daresay Nadal and Murray would beat him in a sprint, fast though he is – but the rapid fire way he can spin about his own centre of gravity. Federer is known as an athlete who is always in a state of balance, no matter how stretched, but I feel Ferrer matches him. Of course, there is no easy comparison – Federer is a greyhound, Ferrer is a terrier indeed. But the one is not superior to the other – they have different qualities. In the first set, del Potro played into Ferrer’s hands. He tried to trade with him from the back – oh, dear. Nobody can do that, Juan Martin, didn’t you know that? You have to bring something else. Federer and Murray, for instance brings their all court games. del Potro has to use power and hit through Ferrer. He remembered to do this in the 2nd, and he won it. Ferrer, that concoction of apparently endless energy, did look a little weary to me. Somehow, he revitalised himself for the 3rd, and that did the trick. I don’t know, though, del Potro surprises me a bit. There was one rally I watched and reran several times, because I’m a bit dim you know when it comes to the technical side of tennis and I wasn’t entirely sure what was going on. But so far as I could see delPo (who was admittedly just inside the base line) hit a decent enough shot but not one of his special powerhouse deliveries, and he anticipated that Ferrer would float a return. So he moved smoothly towards the net and put the volley away easily. That was pretty skilful – I mean, it entailed an area of skill we don’t normally associate with delPo. Why doesn’t he do it more often? He needs to add variety to his game if he is going to really threaten to win another slam, I should have thought anyway. He clearly has the capacity to do so. In the post match on court interview, Petchey reminded Ferrer that he had the delightful prospect of meeting Federer in his next match, against whom he is 0 and 13 or something. What did he think about that? Ferrer gave a delightfully earthy laugh, right from the back of his throat, and admitted he didn’t really have much of a thought, and departed from the court in a high good humour. Ferrer is sometimes called “humble”, a much overused and probably abused word. I prefer to think of him as the lad next door. There are absolutely no airs about him at all. Ferrer is one guy who I always feel happy to see win regardless of who he beats. I hope that some day, he will be elected into the tennis hall of fame. AGREE with this. If you look at Ferrer and his career, there is no other conclusion other than to say he is one guy who has absolutely made the most of his ability. – ALL 4 are 6 foot plus unlike Daveed. Clearly height matter’s in modern tennis, virtually all the new rising stars seem to be a minimum of 6’3. – ALL have ATLEAST 1 weapon in their game- Daveed doesn’t really posses one. For example, for fed and rafa one can say FH, for andy and nole the BH. All deadly weapons renowned in tennis. Daveed, unfortunately, doesn’t really posses one. – ALL, seemingly, posses Daveed’s main strength- brilliant fitness and stamina- and a bit more. So in all honesty, outside the top 4 who just have been naturally more blessed than Daveed, Ferrer really is the BEST FROM THE REST. And that is quite an achievement for Ferrer. I think he does deserve Hall of Fame since he really could be the last top player to achieve as consistently as Daveed has being 5’10 tall! Wog boy, sorry ’bout Nole’s dad. Hope he’s OK for Nole’s sake. You see,Brando,I think there is just a hint of that condescension I was talking about in your attitude to Ferrer. Agreed about the biology, agreed about the lack of a huge weapon. But “brilliant fitness and stamina” (which b.t.w. he has in greater abundance imo than the top4)is certainly characteristic of the man and a huge strength. But it is not his main strength. There is his movement, which is second to none. And then there is his sheer skill with the racket. This is tennis we are talking about after all. No one can retrieve from the base line like Ferrer. That is a monumental skill. It’s not quite enough to get him to the very top, but without it, all his other attributes count for nothing.